Ayodhya, Nov 25 (IANS) The Vishwa Hindu Parishad (VHP) on Sunday said they will not cede an inch of land for anything but a Ram temple and demanded from the Sunni Waqf Board that they withdraw their case over distribution of the disputed land as ordered by the Allahabad High Court (HC). 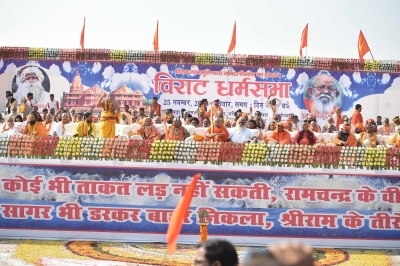 Champat Rai, International Vice President of the right-wing outfit, told a large gathering of supporters at Ayodhya that the issue is non-negotiable for Hindus. 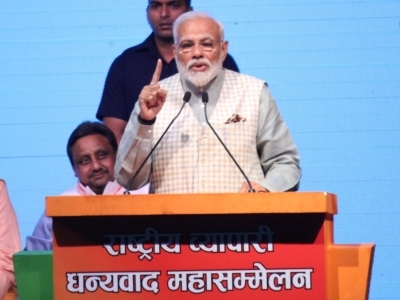 "The distribution of land is not acceptable to us and we want the whole land for Lord Ram," he declared before the 75,000-strong cheering crowds. He also pointed out that the Hindus will not accept offering of "Namaaz" over any piece of the disputed land. Warning that no one should test the patience of the Hindu community anymore, he said they have been battling the matter for the past 490 years. "Some intelligent people think that the whole matter began after the destruction of the Babri mosque in 1992...they are ignorant...the matter goes back to 490 years," the VHP leader said. He also said that the "dharm sabha" had to be called after a gap of 25 years because some intellectuals think that on December 6, 1992 curtains came down on the contentious issue. "The fire has not been extinguished, it continues to simmer inside our hearts." Rai added that this is last such congregation to press for Ram temple and the next logical step for the Hindu outfit would be beginning of construction of a grand Ram temple in Ayodhya. He also demanded that the Muslim litigants should withdraw the case from the Supreme Court and pave way for an early construction of the Ram temple. Another prominent seer Swamy Bhadracharya, however, announced that future plans of the saint community with regard to the Ram temple would be announced after December 11. Amid talks of a possible introduction of a Bill by the Modi government in Parliament's winter session that begins on December 11, many seers are of the view that a "last opportunity should be given to the BJP government on the issue". Earlier, hundreds of thousands of VHP workers and supporters trooped into the venue of the "dharm sabha" and Muslim locals showered flower petals on them. Muslim litigant Iqbal Ansari, who had earlier expressed fear at the growing crowds in Ayodhya for the VHP event, on Sunday thanked the Uttar Pradesh government for "good arrangements".